The first new-design Marshall amp for ages, but tonally it recalls the company's illustrious past. You have to hear it. Ultra cool looks. Bullet-proof build quality. Classic Marshall tone. For many people - guitarists or not - the Marshall ampliﬁer is virtually synonymous with rock guitar. And when you mention the words 'Marshall amp' to a guitarist, most will have some preconception of what sort of sound you're talking about: big, ballsy, cutting treble, punchy mid-range and grinding distortion. It's the sound most people equate with the EL34 output valve when trying to describe it, and that's hardly surprising as most Marshalls have been powered by this workhorse pentode. But what constitutes the archetypal classic Marshall sound? Well, everyone will have their own ideas, but for many, Eric Clapton's contribution to the Bluesbreakers' 'Beano' album represents a crucial turning point and is still the quintessential British blues-rock guitar tone. And this is one occasion where the Marshall sound wasn't delivered by EL34 valves. So here is Marshall's bid to recreate that classic '60s tone, the Vintage Modern series equipped with the 'Beano' KT66 valve as standard. Both stack and combo follow Marshall's traditional styling cues: tough ply cabinets with large radiuses on all the edges and gold control panels. However, the Vintage Modern's vinyl covering sets it apart - it's a subtle black and purple fleck that looks (and is) very exclusive, changing hues from blue to purple to black, depending on the light. The electronics are housed in a typically oversized heavy steel chassis - inside which there are three main through-plated PCBs that support nearly everything, including all the valves and front panel controls. Because of the PCB-mounted valve bases, the four ECC83 preamp valves are recessed and will be somewhat ﬁddly to replace. A smaller daughter board holding the digital reverb circuitry sits atop the effects loop PCB. All the internal wiring is neat and tidy, as you would expect. Overall, it's a tough and hard-wearing package that's designed to handle relentless gigging and will undoubtedly wear well. The KT66 output valves are protected from knocks by Marshall's bulletproof perforated steel rear screen. The Vintage Modern is speciﬁcally designed for those players who like to drive an amp from the guitar - so as a result it's not a multi-channel, multifunction design, but it does have some very interesting features. Next to the single input jack are two preamp gain controls labelled body and detail that aren't cascaded but work in tandem. This is a more sophisticated version of what you would have on a Super Lead if you used a short jumper lead to activate both preamps. Here, the two gain controls are frequency selective, letting you precisely tailor the amount of drive for the guitar's upper and lower registers. Next to the preamp gains are two pushbuttons: one activates a healthy mid-range boost, the other is called Dynamic Range and activates a gain boost for increased distortion. The rest of the front panel is self-explanatory - three-band EQ, presence, a post-phase inverter master volume and a level control for the Vintage Modern's digital reverb. On the back panel, there's a series effects loop with pushbutton switches for loop level and bypass, a jack socket for the two-button footswitch that controls the gain boost and reverb, and a pair of speaker jacks with an impedance selection switch. The KT66 was originally manufactured by the famous Marconi-Osram Valve company as a British alternative to RCA's 6L6 output valve. Like the 6L6, it's a beam tetrode but with an improved design that eliminates the kink in the 6L6's voltage/ current curve - hence the initials KT, which stand for Kinkless Tetrode. Today, like most valves, it's made in eastern Europe and China. Back when it was being produced by M-OV it was widely acknowledged as the Rolls Royce of audio valves, and was standard equipment for many classic valve hi-ﬁ designs. It was also capable of handling much higher voltages and currents than a 6L6. In terms of the character this valve imparts to the Vintage Modern, it's also best described as a transition - not quite as aggressive as an EL34, but punchier than a 6L6, with tighter bass response and improved mid-range clarity. "I wanted the Vintage Modern to nail those classic tones of the JTM45 and pre-EL34 heads," says Steve Dawson, Marshall's design engineer. "KT66s were the only way to go. If you want to get that classic Bluesbreakers tone, it's there - so is the tone Ritchie Blackmore had on the early Deep Purple albums. This is an amp that's designed to respond to the guitar like old amps did, so there's a lot of dynamic range and players who know how to vary their sound from the guitar's volume control will get the most from it. The Vintage Modern also preserves the guitar's character like no other amp I know." Steve Dawson is correct. With a PRS McCarty plugged in, dialling up the classic Bluesbreakers tone was almost too easy - the two tone-shaping preamp gains deliver much of the final sound, while the three-band EQ is for more subtle tweaking. The range of the VM's bass, mid and treble controls is smooth and even, without any undue peaks. At high volumes, even without using the gain boost, there's plenty of sustain with the mid-range punch that only a KT66 will deliver. Single-coil pickups are just as much fun - you can fatten up the tone instantly with the mid-boost switch or leave it off for a more classic response. If you want classic Blackmore or SRV, look no further. 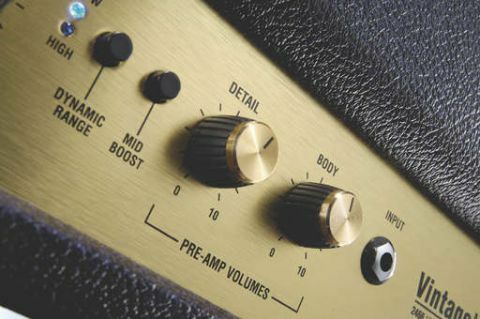 Gain ﬁends can add all the extra distortion and sustain they want by stepping on the boost: in either dynamic range setting the amp cleans up nicely as the guitar's volume control is backed off, making for a rewarding playing experience. The VM's digital reverb is a nice plate type, not too bright and very authentic as most classic guitar parts were recorded using a real plate reverb, literally a large steel plate with a transducer and a pickup. Ultimately, the Vintage Modern is a very rewarding amp to use. While it sounds good at low practice levels, it's when you have things wound up that the magic really starts happening. The G12C speakers (the same as those used on the limited edition Jimi Hendrix stack) are superb and really complement the Vintage Modern's creamy rich overdrive. As you'd expect, volume is there in abundant quantities - the 50-watt head or combo will be more than enough for most players, while the extra headroom of the 2466 100-watt head will really make itself heard on big stages. It's definitely an amp for players who like to drive things from their guitar, and those used to doing this will take to it very quickly. If you're used to having footswitches do everything for you, then you can have a lot of fun discovering how to do things the 'old-fashioned' way.